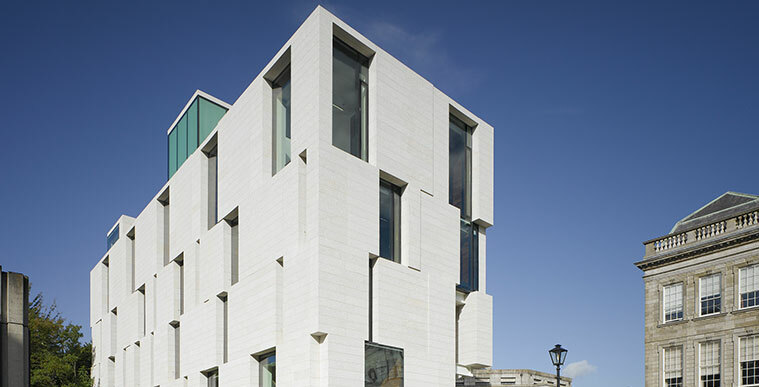 Opened in 2010, the Trinity Long Room Hub building was largely funded by a 2008 award of almost €11 million from Ireland’s Higher Education Authority under the PRTLI IV Programme. The institute is located in Trinity’s historic Fellows Square on the busy intersection between the university campus and Nassau Street. This pivotal location was chosen by the university to highlight the centrality of the arts and humanities to its mission and to society. The building’s striking modernity enters into an exciting dialogue with its classical surroundings and expresses the interaction between the past and the present that the arts and humanities enable and enact. It plays an important role in enticing people into the unique environment of the institute. From each of its many windows it opens new and unexpected vistas onto the campus as well as seeking to open minds to different perspectives. It provides a prominent and symbolic space to convene scholars from across the disciplines and to connect academic debate with the wider public. Quite apart from the events organized and sponsored by the Trinity Long Room Hub, the venue is in full time use by the Hub’s Schools and also by other areas in the university.